When you become involved with federal-aid projects in California, an unusual, but commonly referred number is introduced to you: 88.53. The odd number represents the federal share percentage on local agency RSTP and CMAQ-funded projects … but why? Federal funds typically1 provide a maximum 80% of the project’s eligible cost, with the remaining 20% provided by state or local agency funding. The federal share, however, may be increased2 in states that contain more land under federal control. Specifically, the increased rates are available for states in which designated public lands3 exceed 5% of the total area of the state. Eligible states currently include Alaska, Arizona, Colorado, Idaho, Montana, Nevada, New Mexico, Oregon, South Dakota, Utah, Washington, Wyoming, and, you got it - California. Adjustments to federal participation are made in accordance with the sliding scale rates provided in FHWA Notice N 4540.12. Based on data from the Department of Interior, the ratio of Federal lands area to the total area in California is 0.4263. 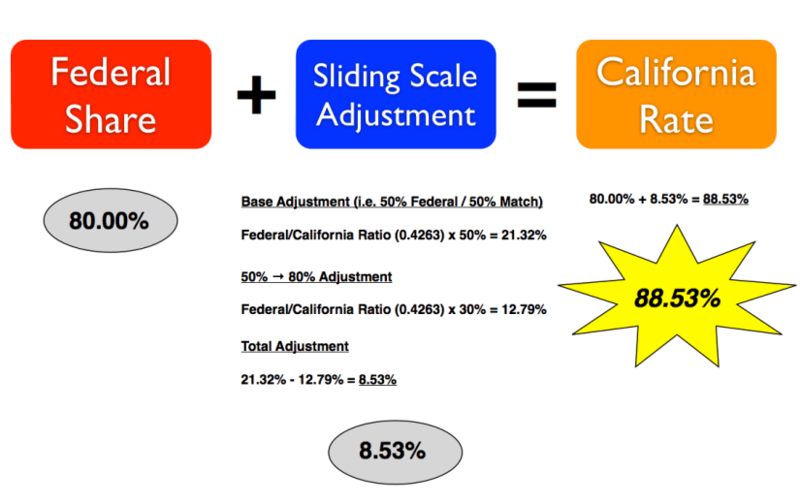 The resulting 80% plus sliding scale rate for California is 88.53%. Hopefully, 88.53 will no longer be foreign to you.